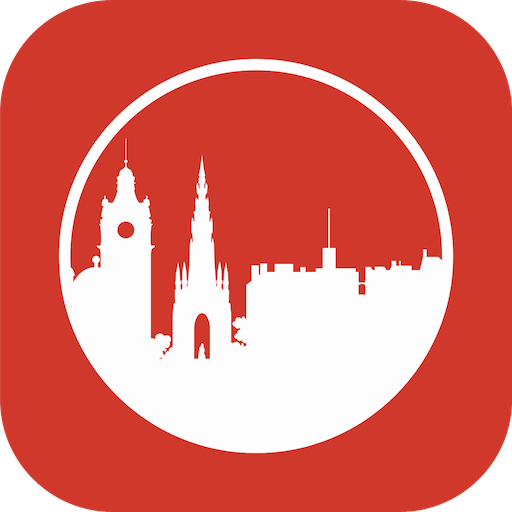 I’d long been of the understanding that one of the Indian restaurants in Morningside was absolutely first-rate, but could not remember which one it was. 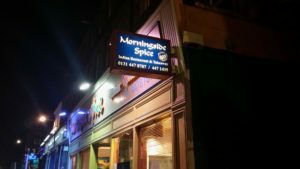 We’d visited the Clay Oven and various others in the past without hitting upon gold, so I suspected that the remaining place, Morningside Spice, was likely the home of the goodies. How wrong I was. I visited on a quiet Thursday. I had the place to myself – although quite a few people popped in to collect takeaway – until about half way through my stay when another table arrived and immediately asked for the lively Indian music to be switched off because it was “very distracting”. That plunged the space into silence with just the waiter’s unbroken stare for theatrical accompaniment. 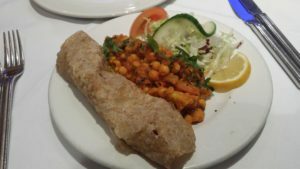 The menu showed signs of promise with a good blend of options from classics to specials, largely in the north Indian and Nepalese style. I started with a chick pea and cauliflower puree which is a regular order for me. I followed with the Kathmandu lamb with mutter paneer and mushroom rice. But first I had the displeasure of enduring comfortably the shittest pickle tray I’ve been served in Edinburgh. 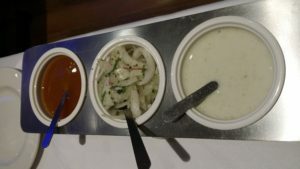 The accompanying poppadoms were light and crisp, but the raita was as thin as milk, the spiced onions were just raw onions, and the chutney was totally generic. This did not bode well. The starter looked reasonable when it arrived, but the channa gobi was completely one-dimensional with some heat at the start resolving to none of the expected warm and complex spicing. It was poor. The main course featured re-purposed tandoori lamb, complete with bright red edges, in the Kathmandu sauce. The lamb was as tough as you’d expect. The peas in cottage cheese was characterless. The undoubted highlight of the meal was the mushroom pilau which was delivered to a good standard and would have been largely unnoticed if all the other elements hadn’t been weak. So overall, Morningside Spice is a restaurant that has run its race and is in need of a long rest at the donkey sanctuary. I suspect this has, at some point, been a much valued place, but it requires a total rethink to be a sustainable prospect for the future. 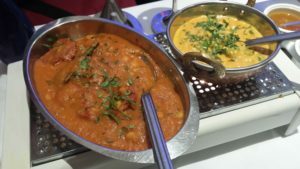 Some of what I sampled will live on as the low-point standard for Indian food in Edinburgh until I’m unfortunate enough to run across somewhere else of really limited appeal. 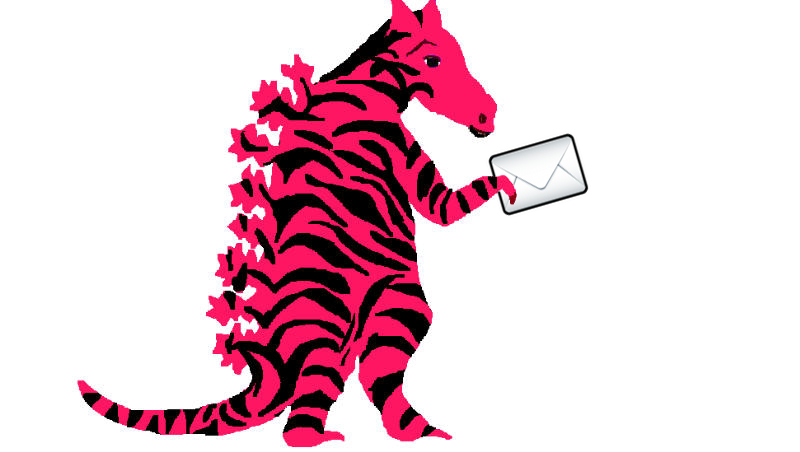 For now, it can only be summed up in one word: avoid.